Munich - In the wake of an historic weekend of Bundesliga action, which saw FC Bayern Munich secure the Bundesliga title with six games to spare and struggling 1899 Hoffenheim take three points off relegation-threatened Fortuna Düsseldorf, we asked you to vote for Matchday 28's standout performer. Six candidates were nominated and the votes poured in from Bundesliga followers the world over, with one resounding winner. bundesliga.com rounds up the results. Bayern vice-captian topped the poll (64 percent), the Bavarians' midfield brain having scored the only goal of the game to sink Eintracht Frankfurt and wrap up a 22nd Bundesliga crown for his beloved club. Aside from his ingenious backheeled strike - his seventh in the league this season - 'Schweini' completed an impressive 93.4 percent of his attempted passes, lost out in the tackle on just six occasions and covered 12.4 kilometres, living up to his reputation as one of the game's finest box-to-box midfielders. 1.FC Nuremberg's came in next following his surprise two-goal salvo against 1. FSV Mainz 05 - a victory which ensured the Franconian club remain firmly in the European mix heading into the business end of the campaign. The Swedish defender's first-ever Bundesliga brace was just enough to see him bump Brazilian pair and Roberto Firmino down into joint-third. As ever, Bayern's centre-back par excellence was in imperious form, ensuring the Reds collected their twelfth shut-out on the road of the season, while Hoffenheim's Samba native Firmino struck for the fifth time in 2012/13 as the Sinsheim club made it a winning start for new coach Markus Gisdol. 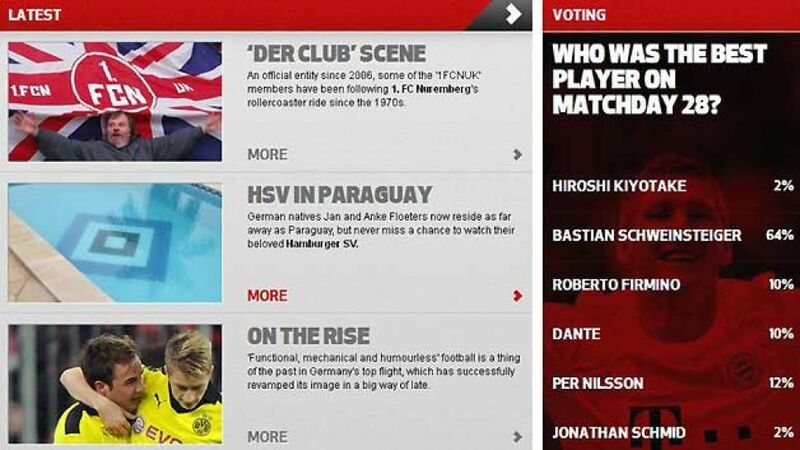 Don't forget to check out our FANZONE page this coming weekend to have your say on the top performers of Matchday 29.